This page introduces the bronze statues of Toshizo Hijikata (standing statue, seated statue, and a bust), who served as the vice commander of the Shinsengumi, located at the Goryokaku Tower. All the statues were created by sculptor Machiko Kodera who was born in Hakodate. The Statue of Toshizo Hijikata was created by sculptor Machiko Kodera, who also created the standing statue and bust and was born in Hakodate. 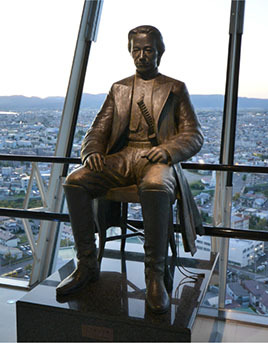 This seated statue is the image of Toshizo Hijikata dressed in western clothing with a frock coat and boots with a sword tied around the waist. 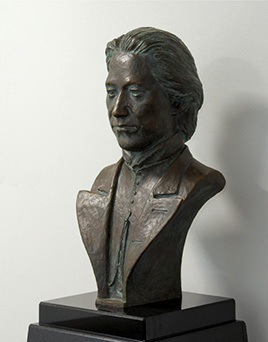 Ms. Kodera spent two years in the making of this statue based on a well-known photo of Toshizo Hijikata. As part of the 40th anniversary project, and as a company involved in the tourism industry, we examined the implementation of a memorial project that leads to promote tourism in Hakodate. As a result, we decided to build a bronze statue of Toshizo Hijikata, who served as the vice commander of the Shinsengumi, to symbolize his deep relationship with Goryokaku because his life attracts sympathy and is supported by many people even today. The statue was created by sculptor, Machiko Kodera. *A miniature replica of the Hijikata statue is available at the gift shop on the first level. A standing statue of Toshizo Hijikata dressed in western clothing holding a riding crop in his right hand with a long sword tied around the waist. As with the standing statue and the seated statue, the bust was created by sculptor Machiko Kodera. 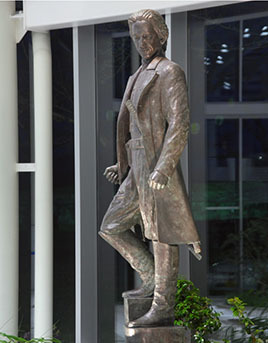 Unlike the standing statue at the atrium, this bust has the height of the face as nearly life size. *Currently, the bust is housed in the office and is closed to the public. Born in Hakodate, she graduated from the Plastic Sculpture Course, Faculty of Art, Hokkaido University of Education. She went to Italy in 1980 to attend the Rome Art Academy, which she completed in 1984. She participated in numerous personal and group exhibitions in Italy and Japan from her atelier in Rome. In addition, she received a prize in the Second Exhibition of Contemporary Japanese Concrete Sculpture and the 12th Exhibition of Contemporary Japanese Sculpture in 1987. In 1989, she won the Third Exhibition of Contemporary Japanese Concrete Sculpture Grand Prix. Eight sculptures are set up within Hakodate, including Blue, Ocean, Thetis (Wakamatsu-cho, in front of the former Sea Port Plaza), the Statue of Commodore Matthew C. Perry (former Hakodate Hospital site, Perry Plaza), Harmony (Hakodate City Central Library), Harp of the Northern Sky (Hakodate Airport Building), Small Triton (Hakodate City General Health Center), and Statue of a girl wearing red shoes (Hakodate West Wharf).